Want to add lots of fun to SMS, email, Facebook and Twitter? Look no further! Use this app to create amazing text effects and decorate it with cool ASCII arts. Top it up with built-in 1200+ emoticons. Send holiday greetings, play a prank on friend, propose your soul-mate, send cute, funny or crazy messages to your loved ones. In short, have lots of fun with ⓉⒺⓍⓉ! 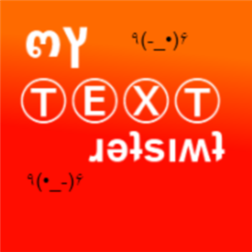 ♥ Type in inverted, rounded, leet speak and many more..
♥ SMS or email your created text directly from the app. NOTE: A Pro version is also available without advertisements. Purchase it to get rid of ads and help support development. Warning: Sending ASCII arts and emoji as SMS relies on your service provider’s support for sending 16-bit Unicode text SMS and the receiving phone’s support to receive such messages. In case the receiver is not able to see the messages properly then it’s probably a limitation of his phone or his service provider. Most service providers support for sending 16-bit Unicode SMS and all Windows Phone handsets and other modern handsets are capable of sending and receiving such SMS. Visit us online at http://kunruchcreations.com for tips and tricks and more.